REX-POL Sp. z o.o. produces baking ovens that are fully automated, energy-saving and safe for the environment. Because of the baking technology in the food industry we produce chambers with horizontal air flow in a device. Baking oven is designed for thermal processing of meat, cured meat products, pie and preserves. The device allows for technological processes: baking, steaming, humidifying, pasteurization or defrosting. Baking ovens, due to their modular structure are made in single, double or multi-trolley versions depending on the client’s needs. The device can be supplied by gas, oil or combination of electrical and steam energy. Standard version of the baking oven is equipped with following subsystems: high-class microprocessor controller ensuring automated regulation of parameters of every process inside the chamber, two-stage air circulation system inside the chamber and automated oven cleaning system. 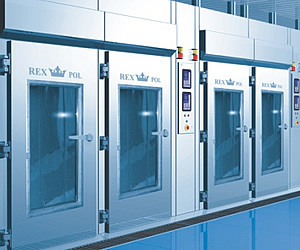 Baking ovens manufactured by REX-POL are characterized by long life and many years of high performance because of the best materials and reliable technical solutions.